Building a house or baking a cake both require a process and key materials to guarantee success; creating artwork for grand format printing is no different. Amazing creative produced after hours of writers and designers collaborating can implode if the production artist preps the files incorrectly. Colors will be a confused mixing CYMK with RGB, type might go rogue without a font file or images replaced by … dare I think it … the box of broken links. However, BPGraphics has a simple 6 step road map to guarantee your project doesn’t get held up by detours back to the designer. 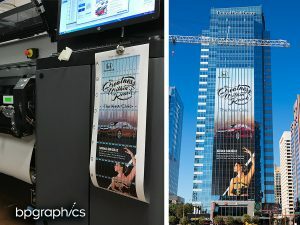 There are some significant size differences between the printing in the office and printing graphics that wraps an entire 10-story tall building. At the most basic level, traditional volume printing is going to include images that can fit on your desk printed via off-set printing or in many cases WEB printing. Wide-Format printing is a popular choice for photography exhibits, large graphics such as vehicle wraps, window graphics and other materials under 5’ wide. Grand-Format printing is big league. 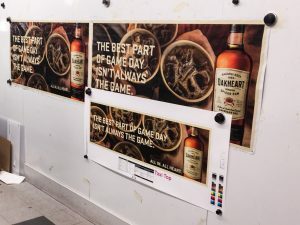 Graphics are generally printed on 16’ wide presses with multiple sheets combined to create massive graphics up to (and sometimes exceeding) the size of a football field or wrapping an entire hotel. Generally, the closer the dots the greater the image resolution; but this is subjective of viewing distance. A print of your kids on the wall might be viewed at 24-36 inches away and must have a continuous tone look with a very tight print pattern of 300-600 dpi at 100%. However, a wall mural is typically viewed dozens of feet away and buildings or a bulletin might be viewed at yards or blocks away. These viewing distances allow for loose dot patterns that human eye will sharpen the further away one stands. Because of this, the resolution doesn’t need to be very large and is generally created to scale. A designer’s work flow can be improved by designing print files set to our spec sheets. For instance, a 20’ x 60’ bulletin is correctly created at 1:24 scale providing an easy to manage file that proofs well and prints beautifully. That translates to 10” x 30” at 300-600 dpi, a very manageable 412-megabyte PSD file (file size will very based on color use, image contrast and font usage). Color space for a printed graphic is important. BPGraphics produces all graphics using CYMK builds and need files created in the CYMK space for best results. Files created in RGB and “switched” to CYMK have a tendency to lose saturation and detail. When this happens, we work hard to fix the shift but it’s best to start with CYMK images corrected for this space. Colors accuracy in a print can change appearance based on the ambient light temperature and ambient brightness of the image. Plus, is it a screen projecting color or a print reflecting color, and the texture of the paper or even the finish (glossy, luster, matte, dull) can affect color. With so many color influencers, it’s important to always include a hard-printed sample with your design so our team (sometimes thousands of miles away) can insure our finished print matches the colors you are expecting. Color profiles on IPS monitors using color calibration systems match colors internally; but nothing beats a printed sample your team has pre-approved as correct for an pre-press match. Was that headline Avenir or Avenir Next or Avenir Next Condensed? They look very similar and the font ID is slightly different between a PC and a Mac system. Fonts can make or break your printed graphic’s message or emotional appeal. Similar to small format printing, always include the font with your print file folder or at the very least convert the text to outlines if created in Illustrator or InDesign, Rasterized font layers are preferred if created in Photoshop if fonts are not provided. Using a “Package” option to group all your fonts and images into a folder for easy production. Lastly, try to embed your linked files before sending finished artwork so there are no broken links. If you have packaged a print file folder, be sure to include all logos, linked images and fonts for a smooth pre-press experience. Linking files and providing them via an images folder is preferred as this approach keeps the parent file smaller and easier to work with. Illustrator and InDesign allow linking files, Photoshop uses Smart Objects for similar control. If you have more questions about how to prepare your print file before submission, simply ask your BPGraphics account representative for the correct spec sheet or visit our website to download both templates and mechanical specifications for popular products.